Drag fans will delight in seeing Cary Grant don a horse tail wig and slip into female military regalia to become Florence – a rather ugly woman, to be sure, but one who manages to pass the scrutiny of a some pretty butch Naval officers. The only drawback is that this crucial plot point, the one after which the entire movie is named, doesn’t happen until right at the end of the film. 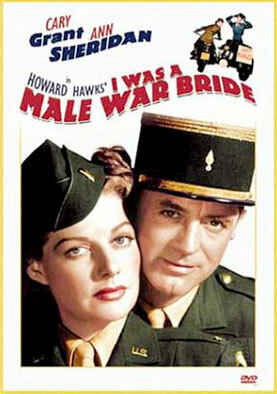 Still, there are plenty of other amusements to be had along the way in this screwball comedy, not least of which is the feisty performance by Ann Sheridan as Lieutenant Catherine Gates, an American officer who does her own fair share of cross-dressing, slipping out of her skin-tight skirt and into overalls, helmet and goggles to ride astride a motorbike with Grant’s male persona, Henri Rochard (a French Captain sans any hint of an accent) perched nervously in the side-car. Made on location in Germany just a few years after the 2nd World War, the film avoids any reference to the Holocaust or the downfall of that nation, preferring instead to entertain audiences with light-hearted slapstick in an attempt, perhaps, to make them forget all the horrors that actually occurred. Director Howard Hawks, who famously helmed Gentlemen Prefer Blondes, has teamed up again here with that film’s screenwriter, Charles Lederer, to adapt Henri Rochard’s autobiographical story for the screen. Hawks is also reunited with Grant who he’d worked with on the hits Bringing Up Baby and His Girl Friday, but the winning combination isn’t entirely successful. Maybe it’s the unusual structure of the piece; the antagonistic relationship between Rochard and Gates turns romantic half way through with the remainder of the film devoted to the difficulties they face getting married and consummating it. Rochard is officially ‘an alien spouse of American military personnel’ and the amount of red tape that they encounter when Gates’ army unit get recalled to States is not to be believed. It’s a wry comment on the sexist nature of that era’s military bureaucracy and the only way around it, it seems, was in a frock.